The High Council Chamber during a Council session. The High Council Chamber was an enormous hall within the holy city of High Charity that the Covenant High Council met within to discuss policy, discipline, promotions among ranks and military plans. The High Council Chamber after the Flood's infestation of High Charity. The High Council Chamber was constructed as a part of High Charity by 850 BCE. 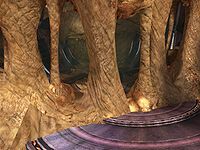 At first, the chamber was only used by the Hierarchs of the Covenant, but eventually Sangheili and San'Shyuum government delegates would form together inside the chamber to establish the High Council. In the aftermath of the Battle of Installation 04, the High Council Chamber hosted the trial and condemnation of Sangheili Supreme Commander Thel 'Vadamee, who was deemed a heretic for his failure to ensure the safety and survival of the Halo ring. During this spectacular trial, it was deemed that he was to be disgraced and executed for this grave offense, but instead was spared by his appointment to Arbiter. During the Battle of Installation 05, John-117 was teleported there by the Flood Gravemind. He then aimed to kill the Prophets and take Installation 05's activation index to stop the Covenant from activating the ring, however, the Prophets escaped through a lift at the end of the hall and the Chief had to kill Jiralhanae Honor Guardsmen to advance toward the San'Shyuum. Following the Flood invasion of the station, the chamber was taken over by the Gravemind. In the Chamber, the Gravemind interrogated the UNSC AI Cortana for more answers on the Halo rings inside the Council Chamber. The chamber was presumably destroyed along with the rest of High Charity when the city was destroyed by John-117 in 2552. The High Council Chamber was located in the High Council tower on High Charity. The walls of the chamber were lined with large bleacher-like seats, and it appeared much like a stadium in shape and a circular opera house in design. The San'Shyuum and Sangheili High Councilors sat on opposite sides of the chamber. In the center of the chamber was a podium from which a member of the Covenant stood to speak or be judged. On one end of the chamber was the entrance to the Sanctum of the Hierarchs and from this end the three High Prophets sat and addressed the Council. On the other end was an entrance, flanked by two Forerunner pillars, leading outside to open city of High Charity. Behind the Hierarchs' platform, the chamber featured a decorative backdrop of luminous blue and violet panels. There was a pillar-lined plaza nearby the chamber with a terrace. This plaza was occupied by wealthy and influential members of the Covenant during an Ascension ceremony, such as Kig-Yar shipmasters and Yanme'e queens. At the entrance of the chamber there was two identical Forerunner relics standing. The Council Chamber actually makes an appearance among the Flood infested scenery of the level Cortana. However, the elevator platform was pushed outside of the newly formed Flood walls. Sangheili bow before the Hierarchs in the chamber. Another view of the chamber. Thel 'Vadamee before the Hierarchs in the chamber. The exterior of the chamber. The High Council chamber as seen when not in session. One of the two identical Forerunner relics at the entrance of the chamber.